During (and around) VMworld 2017 VMware has lifted many of their products to a new level to enable their customer a better and more agile software-defined datacenter than ever. Besides their datacenter portfolio VMware is pushing their vision of a digital workspace in the end-user computing field much further. 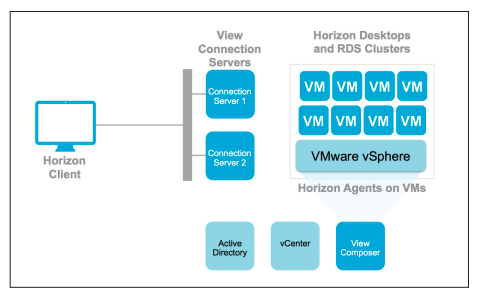 Horizon + Airwatch -> Workspace One try to combine all relevant subjects within the EUC field (Identities, Desktops, Applications, Devices, Policies, … ) within one single solution. The following post summarize the EUC announcements within VMware’s current and upcoming products. The following section shows you how to make use of VMware’s Unified Access Gateway (UAG) Appliance to give the enduser access into our virtual Desktop / Remote hosted Applications over an unsecure network like the Internet. When we are creating this access we have multiple options. Using a VPN to ‘tunnel’ into the secure cooperate network environment and connect further to the Horizon View environment. Placing a Windows Server in the DMZ and installing/configuring the Horizon View Security Server and make it public accessible. 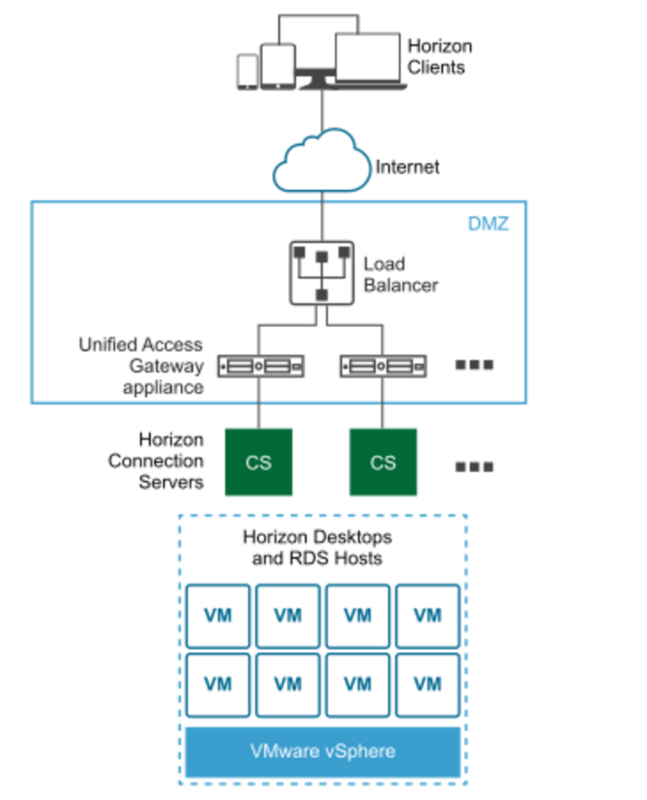 Placing the virtual Unified Access Gateway in the DMZ and installing/configuring the Horizon View Security Server and make it public accessible. What is the / my recommendation nowadays? Go with the Unified Access Gateway. Why? It is a general opinion within Security experts that a Windows, even if it’s hardened, offers more attack potentials than a hardened minimal linux. Using the Windows based security server creates a 1:1 relationship between the Security Server and the Connection Server, therefore it takes away some access flexibility. One important aspect of the UAG is that you need to know about the packet-flow between the Horizon Client and the Desktop. You will be dependant on the networking and security guys. Make sure you are able to clearly articulate the requirements and what is going to happen. If you can tell the flow, the other people will be able to help you much better. 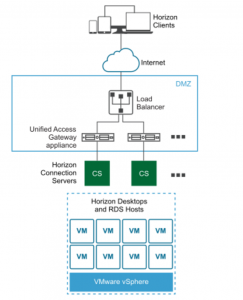 In the following article I am going to tell you how easy it is to set up a load balanced Horizon View environment. But remember: Just because something is easy to install it is not necessarily easy to design. There are multiple design affecting factors I am going to discuss in my #design guide. There are many Installation Guidelines out there, so I will keep it quick and simple and try to give you some hints what to do or not to do. What do I want to achieve or show to you in this blog post?